Maltaward offers CCTV tower and standalone wireless camera systems as a security solution for vacant properties. Complementing our range of concrete barriers and void property security solutions, our CCTV systems help to deter intruders as well as preventing theft and vandalism. Our systems feature automatic detection of intrusion of travellers, squatters or attempted theft, with cameras deploying automated sirens and voice-warnings. The cameras are remotely monitored so that security can be dispatched to the site as soon as possible. If you would like to learn more about the range of CCTV solutions we offer or would like to discuss a quote for a property, please contact us today. Typically, after a commercial property has been vacated Maltaward reviews the perimeter security before delivering concrete barriers to secure gateways and weak points on the site. We can offer to install CCTV camera systems to monitor the site, as well as to secure openings with window screens and security doors. We can also secure access to any external staircases to reduce opportunities of access to the roof area. We offer two types of CCTV services, either a CCTV tower or a standalone wireless security camera system. 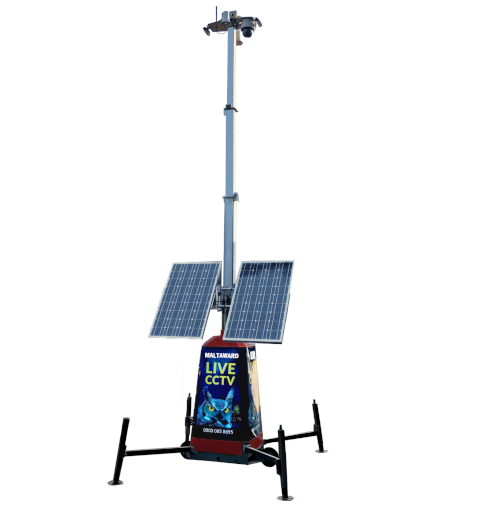 Currently a 6-metre CCTV tower system is a popular choice. Easily transported and quickly deployed, the tower is perfect for vacant property and construction sites that require remote monitoring. Available with either high capacity batteries (with up to 4 weeks operating time), or indefinite use with solar panel or mains power. We are now offering a new Wireless Standalone Camera System with a greater range of benefits. Rather than being tower-mounted, these cameras can be placed in a variety of locations such as a fences, buildings and posts. This gives the site a more flexible surveillance coverage to include areas where a tower may have restricted views. The cameras are standalone and wireless, so they can be placed anywhere across your site without having to worry about how they need to be wired. Why do I need CCTV monitoring? Vacant property can be easy targets for trespassing from travellers and squatters and are often vulnerable to high volume fly tipping. Construction sites can have high value equipment and materials unsupervised whilst the site is closed. A CCTV camera system can monitor your site to deter intruders and dispatch security when necessary. Can Maltaward provide a full range of services alongside CCTV? Yes. Maltaward specialises in supplying a full range of perimeter and site security solutions ranging from barriers and gates to window screens and security doors. Which CCTV solution is right for my site? We offer both wireless cameras and CCTV towers. The right choice for your site will depend on your needs and requirements. Our team of professionals can provide you with advice and guidance. Where should I site CCTV cameras? Tower CCTV can be placed in a position that allows for the best vantage point for the largest area of the site. Wireless cameras can be placed anywhere across your property. Our team can offer suggestions for the most effective positioning of CCTV. Are you interested in having CCTV installed at your site? Please get in contact with the team at Maltaward today. Our experienced staff can talk you through the range of options available and provide and information you require. You can call us on 01293 854 930 and or email admin@maltaward.co.uk and we will get back to you as soon as possible.